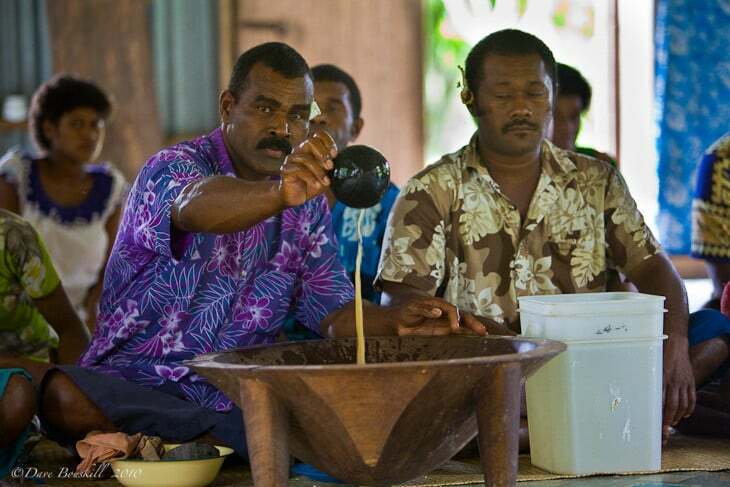 When visiting Fiji you will find yourself taking part in many a Kava ceremony. It is an important aspect of visiting any village and it is customary to present a gift of Yaqona (Kava root) to present to the executive head of the village. It can be a little confusing when you don’t know what to do, but don’t worry, the Fijian people are very patient and will talk you through the process. 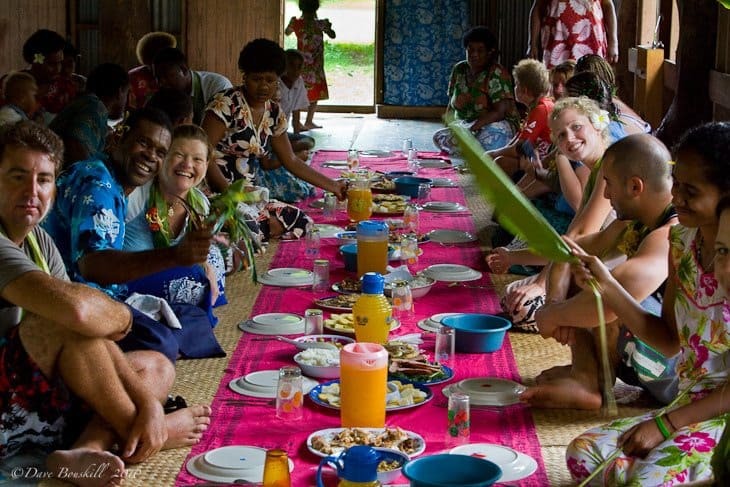 But to make things a little easier for your next trip to Fiji here are some facts and tips on what to expect when partaking in your very own Kava ceremony. Everyone must sit down and remain seated during the kava ceremony. A high tide means you would like a full cup, if you ask for a low tide, it means they will give you a half cup of Kava. Once you drink Kava, you will probably feel tingling and numbness in your tongue. Kava is a very mild narcotic and is known to make people feel relaxed. You are guaranteed to have a good nights sleep after a couple of high tides and you will wake up feeling well rested and energized. Fijian people are known to be some of the happiest on the planet and somehow we think that the Kava may have something to do with that. It was sold as an relaxant in the States in pill form at one time, but they couldn’t capture the exact formula of drinking it fresh from the root. Once the Kava ceremony is over, the festivities of song and dance can begin. The Kava ceremony brings two families together and they are now one after the ceremony. It is a big celebration after the Kava ceremony with dancing and music. It's a wonderful way to interact with the local villagers. Don't be shy, join in the dancing. Fijians are the most friendly and welcoming people on earh. After the Kava ceremony, the visitors are free and welcome to enter and explore the village as they please. 31 Responses to "Kava Ceremony in Fiji Etiquette"
I am inquiring to know if I could use a copy of the first photo from this web page (ttp://theplanetd.com/kava-ceremony-in-fiji-etiquette/) for the publication. Hi Patricia, you can contact us at theplanetd (at) gmail (dot) com Cheers. I am a photographer based in Canada. Recently I have had a few clients of Fijian origin. I was introduced to Kava by one such client. The first time I took it, I was anxious as to whether it would make my hands less steady to take pictures. The family assured me it’s nothing like alcohol. Just the relaxed feeling. I tried it. Loved it. Usually wedding shoots means 8 to 10 hours of shoot. My wrists do take a brunt of the heavy camera load. Kava just works like a miracle. Mind is clear, yet I am alert. It’s difficult to explain. I love the feeling. I am so glad I was introduced to Kava. Hi everyone! As a first timer travelling to fiji I would love to try a kava ceremony but have worries as to whether it would make me sick. Do they use safe drinking water that is suitable for travellers to consume? I would image they would but I would hate to pick up a tummy bug that would ruin my trip. That’s a good question Sarah. I’m not sure how they filter the water, but we had quite a bit of Kava and were completely fine. I don’t know of anyone who got sick from Kava. I have a feeling it is like drinking alcohol. All the parasites and bacteria are fermented away. I’ve taken Kava for my anxiety for years and only recently have started to look into it’s cultural importance and history in other countries. Thanks for this post. Interesting thanks Mike. I had heard that you can buy it in the pill form, I can believe that it would help with anxiety. You feel very relaxed after drinking it. Great post. Allow me to add that while drinking kava is the hard fix to overcoming depression and anxiety, the softer subtle cure comes from the camaraderie experienced when interacting with others. Been there, done that. And Kava does taste like muddy water! Hi Dave and Deb, thank you for sharing this! I love the formality of ceremonies like this. I’ve been intrigued with kava ever since I interviewed photographer Greg Davis for my blog. One of the best experiences of his RTW trip was drinking kava with locals in Fiji. .-= Jennifer Barry´s last blog ..Live Richly Round-up 8- Thanksgiving Edition =-. Thanks for writing up these steps for a traditional Kava ceremony. My cousin in Hawaii had a few bags of powdered kava that we experimented with and I became extremely relaxed, good stuff! Would love to try out a real ceremony sometime! .-= Migrationology´s last blog ..Casinos- Fortresses and Egg Tarts- 12 Hours in Macau =-. I really didn’t like the taste of the Kava (it’s like dirty sandy water, urgh) but the ceremony itself was fun, for sure. The traditional singing was so awesome. The first ceremony we went to, the guy who wrote the Lonely Planet Fijian phrasebook took us to it! Then the villagers took us out on a outrigger canoe at sunset which was amazing. Fortunately, as a woman, after the first cup of Kava I had the option of saying I didn’t want anymore. The Fijians assume it’s “too much” for women to deal with so they let you get away with it. Men have less of that option but if you’re a foreign guy, they don’t look down on you as much as they would a Fijian man who turned down Kava. Ummmm, love me some kava! Great post!!! How fun! Years ago I had tried the pill form of Kava to help me sleep but it never did work well, I’m sure because you’re right – they can’t really distill the essence of the root and keep it strong enough in pill form…especially since most people would not like to feel a numbness…but Fiji is on my “bucket list” so now I will look forward to experiencing this ceremony! 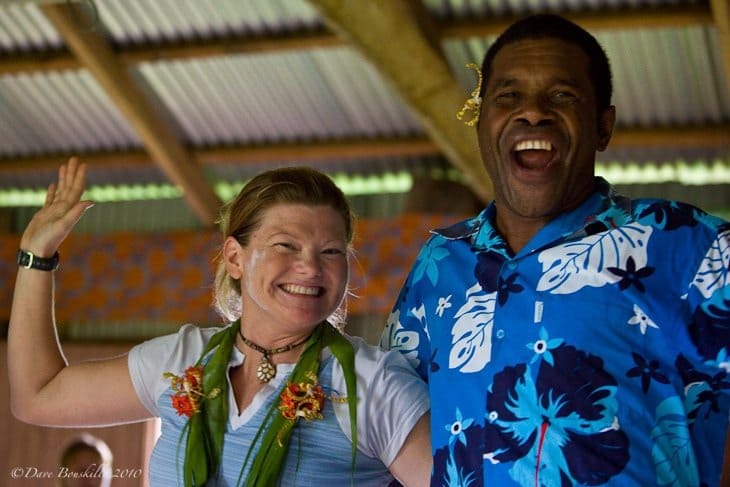 This was also a highlight for me on my trip to Fiji many years ago…I still remember it well.. We brought Kava and partook in the ceremony as a request to enter their village and to hike to their waterfalls (one of my BEST travel experiences!). .-= Melanie´s last blog ..Nov 21- First Time Flying =-. You know there are so many things I wish I had better documented before I started blogging and my Kava experience is one of them. It was definitely a highlight for me in Fiji. .-= ayngelina´s last blog ..Viva Cuenca! =-. Great post… what I want to know is how did kava taste?! I’ve heard it tastes just like muddy water. .-= Kieron´s last blog ..5 reasons we’re joining the gym before traveling =-. Great question Kieron, so good that I added the answer into the post. I actually meant to do that, so thanks for reminding me! And you are right. Kava tastes exactly like muddy water with a bit of bitterness. But really, it is just like muddy water. But the Fijians seem to love the taste. I think it is an acquired taste. Dave and I didn’t mind the taste at all.